The Canadian Cross Country Championships took place this past Saturday at Jericho Beach in Vancouver, British Columbia. New Brunswick was very well represented with 5 athletes making the trip. - Katie Robinson of Saint John finished 52nd in the junior girls 5km race in a time of 19:52.75 while Taylor Dunn of Fredericton finished 58th in a time of 20:03.97. - Josh Shanks of Saint John had an unfortunate fall later in the race but was still able to finish the race coming in at a time of 29:11.06 to finish 103rd. - Ryan Cassidy of Grande-Digue and Barry Britt of Hampton proved to be the stars for Team NB coming in at times of 32:03.71 and 32:13.98 to finish 4th and 5th respectively. Both Cassidy and Britt have qualified to represent Team Canada at the NACAC Cross Country Championships set to take place in Mt. Irvine, Trinidad and Tobago in late February! "These results are incredible for the province of New Brunswick", said Gabriel LeBlanc, Technical Director of Athletics New Brunswick. "To have two runners in the top five in one of the strongest races in Canada is absolutely outstanding!" he added. The Canadian Cross Country Championships are set for this Saturday, November 30th, in Vancouver, British Columbia. New Brunswick is going to be very well represented at this championships, with 5 athletes competing. Taylor Dunn of Fredericton and Katie Robinson of Saint John will compete in the junior women's 5km race. Dunn was a bronze medalist at the NBIAA Cross Country Championships while Katie Robinson was the top rookie in the AUS Cross Country Championships where she finished 8th, and at the CIS Cross Country Championships placed 69th. Joshua Shanks of Saint John will compete in the junior men's 8km race where he will be aiming for a top six finishing spot to automatically qualify to be on Team Canada for the NACAC Cross Country Championships, set to take place in Mt. Irvine, Trinidad and Tobago. Shanks had already proven himself to be a world class athlete, having been selected to be on Team Canada to compete at the 2013 IAAF World Youth Track and Field Championships where he was the only runner from the western hemisphere to make the 3000m finals. Barry Britt of Hampton and Ryan Cassidy of Grande-Digue will also be looking to qualify for the NACAC Cross Country Championships. Cassidy has just come off a 6th place finish at the CIS Cross Country Championships, qualifying him to represent Team Canada at the World University Cross Country Championships set to take place in Entebbe, Uganda in late March. Both Britt and Cassidy had qualified for the NACAC team just 2 years ago after Britt claimed silver at the Canadian Cross Country Championships and Ryan won gold in the junior division. The 14th Annual Gagetown Indoor Meet took place this past Saturday in Oromocto. With this meet being the first of the season in New Brunswick over 150 athletes competed with 7 provincial records broken. The star of the meet was undoubtedly was Cameron Levesque a young sprinter from Drummond who broke the bantam boys 150m record by 0.70, running a time of 18.98, as well he demolished the bantam boys 60m record, surpassing the old record of 8.06 with a time of 7.69. Steve LeBlanc of Riverview (ASEA) broke the masters 40-45 weight throw record with a throw of 9.83 meters. Ross Belyea of East Brighton destroyed the masters 65-70 record with a jump of 3.94 meters, surpassing the old record of 3.16 meters. Blaise Lapointe of Oromocto (MOT) broke 2 Para-athletics record in the T44 category 60m with a time of 8.91 and in the 200m with a time of 30.21. Christel Robichaud of Moncton (ASEA) broke the Para-athletics T58 shot put record with a throw of 4.90m. Other highlights included Jason Bouchard of Oromocto (FLTC) winning both the senior 60m in 7.14 and 200m in 22.75, Samanta Taylor, only 14 years old, of Canterbury running the fastest 60m by any female sprinter with a time of 8.29 in her heat, and Zoe Berry of Estey’s Bridge (UNB) who won both the shot put and weight throw with throws of 11.63m and 14.71m respectfully. ‘’This was a great first event of the season for many of our athletes’, said Gabriel LeBlanc, Technical Director of Athletics New Brunswick. ‘’It’s very promising to see so many great results this early in the season’’, added LeBlanc. The last indoor track meet in New Brunswick for the 2013 year is set to take place in Moncton on December 21st. Many athletes are expected to be in the hunt for provincial records as many athletes will be moving up age classes on January 1st, 2014. Athletics New Brunswick is pleased to announce its 2013 award recipients. The ANB awards Gala is held annually to recognize the accomplishments and contributions of our athletes, coaches, officials and volunteers in Athletics. 2013 has been one of the most successful year for Track and field in New Brunswick with over 45 provincial records being set, 9 Canada Games medal and a Canadian Record . ‘’2013 was a result of the great continuance of our program. Our coaches, volunteers and athletes achieved amazing feats’’ said Gabriel LeBlanc Technical Director of Athletics New Brunswick ‘’ It was extremely difficult for our selection committee to chose the winners as we had so many worthy candidates ’’ added LeBlanc. ANB had AMAZING night at the Sport New-Nouveau Brunswick Pitney Bowes Sport Awards . Also Steve LeBlanc, Earl Church, Greg Allen, Carl Macintosh, Gabriel LeBlanc and Jason Reindl was honored by Coach NB with the Coaching Excellence Awards. The first indoor track competition in New Brunswick is set for this Saturday with many of the provinces best athletes competing looking for a new provincial record before many athletes switch age classes on January first. Over 140 athletes are set to compete, with many of this year's Legion team and Canada Games team on that list. The women's 400m will feature Canada Games team member Sarah Myatt of University of New Brunswick coming in with a seed time over 8 seconds faster than her closest competitor. The women's 800m will feature a field of several young athletes including Legion team members Leah Macaulay of Fast Tracks (FFFT), Chelsey Hall (FFFT), Luisa Schwarz of Fredericton Legion Track Club (FLTC), and Alexondra Kiely (FFFT). Schwarz was a silver medalist in the youth 1500m at Legions, as well as the gold medalist in the 3000m. Both Hall and Schwarz will also compete in the 1500m. The men's 60m where Jason Bouchard of FLTC is ranked first with a seed time of 7.06 seconds, the fastest by a fifth of a second! New Brunswick youth 200m record holder Jocob Hayes, now a junior competing for UNB, is ranked second with Canada Games team members Dan Brown (UNB), Alexander Peabody (UNB), and Brandon LeBlanc (STU) also competing. Matthew McLaughlin of Fast Tracks will be competing in the 200m and 300m. McLaughlin has ran under 50 seconds for the 400m multiple times and will no doubt be after a provincial record. The men's 1500m will feature Team Canada member for the World Youth Track and Field Championships Josh Shanks of Saint John Track Club, as well as Legion team member Alex Amos of Fast Tracks and Shayne Dobson of Universite De Moncton, dual medalist at the 2011 Parapan American Games. The long jump will feature Pierre Landry, coming in with a seed jump of 7.06 meters, more than a meter over his closest competitor. Both the shot put and the weight throw will feature Canada Games team members Aaron LeBlanc of Universite de Moncton and Jonathan Gionet of St. Thomas University. The shot put will also feature notable pentathlete/decathlete Jason Mackenzie of ASEA. Also in action will be Veronica Coombes, the young wheelchair racer from ASEA who captured 3 silver medals at the Canada Games this past summer. Just after the meet will be the ANB Annual Awards Gala where top age group athletes will be awarded for their excellence over the year. Run New Brunswick had its annual awards this past Saturday in Moncton, with several ANB members given awards for their outstanding racing on the roads this year. 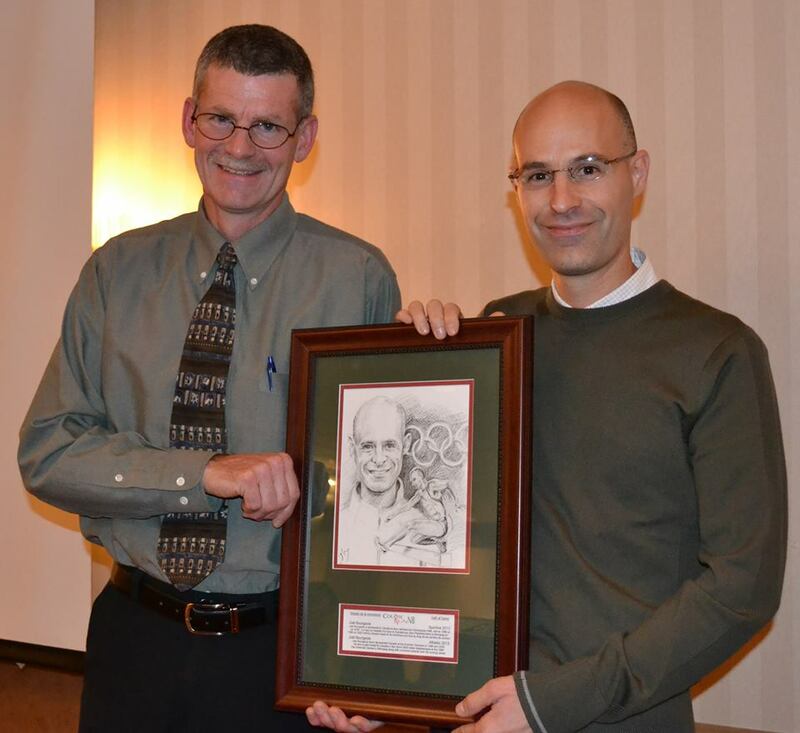 They also honored Joel Bourgeois and his father, Paul-Pierre Bourgeois, who were both inducted into the Run New Brunswick Hall of Fame. Joel was a two time Olympian for Team Canada at the 1996 and 2000 Summer Olympics in the 3000m steeplechase, as well as the gold medalist in the 1999 Pan American Championships and silver medalist at the 2003 event. Joel has also been a coach for both Genvieve Lalonde and Ryan Cassidy, both having carried on his legacy in the steeplechase event, with both athletes competing in the event at the 2010 World Junior Championships.Paul-Pierre held many Canadian Master Records and coached many young runners. Bryan Thomas of Bathurst was named the Upcoming Male Runner of the Year for his outstanding road race times this year, including a 17:215km, a 35:21 for the 10km, and a time of 1:31:20 for the half marathon, which he also won the provincial age group championships for. Laura Dickinson of Miramichi was named the Upcoming Female Runner of the Year for her outstanding season on the roads. Dickinson came onto the scene just this year to blow away the 19 & under division, setting times of 18:23 in the 5km and 40:40 in the 10km at just the age of 14 years old. Thomas was also given a $250 scholarship along with Brandon LeBlanc of Riverview who also had a great season on the roads, placing first among juniors at the Canadian Half Marathon Championships in Montreal with a time of 1:24:23, as well as times of 17:41 for the 5km and 37:12 for the 10km, which he also won the provincial age group championships for. Also to be noted that Dr.Paula Keating of Miramichi was named female runner of the year for the 5th consecutive year while Lee Roy of Bathurst will took home his second consecutive male runner of the year trophy. Maryse Jacob, a 70-year-old runner from Shediac, received the inspirational person of the year award. Jacob, a cancer survivor, enjoyed a strong season, running in 19 New Brunswick Running Room Super Series events and finishing first in her age group in all 19. FREDERICTON (NB) – More than 2,600 children participated in "Small Strides, Healthy Lives”, the New Brunswick Medical Society\'s & RunNB\'s popular children’s running program during the 2013 road racing season. "Doctors are thrilled to be able to support the development of healthy habits in our youngest patients" said Dr Lynn Hansen, President of the New Brunswick Medical Society. \"Children are getting a medal, parents are taking pictures, and it\'s wonderful for us to help spark a child\'s lifelong passion for exercise. Our whole province benefits from the health of our youth." Ross Britton is the new Canadian Master Athletics-Provincial Director for New Brunswick. Ross replaces Bill MacMackin, who continues to be the President of Athletics New Brunwick. Athletics New Brunswick would like to take this time to acknowledge the great work of all of its coaches ! Your dedication to our sport and our youth is truly amazing! THANK Y0U! Over the next few months these individuals will be reaching out to our members to identify how we are doing as well as where we can improve and grow. We also encourage our members to be proactive and contact any of us with your thoughts and suggestions. The final plan will be drafted by April 2014 for final review and approval at the ANB Semi Annual Meeting. LONDON, Ont. (CIS) – The CIS Cross Country Championships were held this past Saturday New Brunswick was very well represented! Ryan Cassidy's 6th placing earns him a spot on Team Canada for the FISU Cross Country Championships to be held in Entebbe, Uganda. As well, Gen's university team, the Guelph Griffons once again won the CIS team title. It is with great sadness that Athletics New Brunswick mourns the passing of the organizations past president, Harold Nicholson. Nicholson passed away November 6th, 2013 at the age of 66. Harold served as the president of Athletics New Brunswick from 1989 - 2011 and was certainly the leading factor in making Athletics New Brunswick the organization it is today. Harold was also a Canadian Legion Youth Championship Team coach and Canada Games Team coach for many years, and in 2012 was awarded the National Investors Group Volunteer Sport Administrator of the Year at the Coaching Association of Canada for all of his work in the sport of athletics in New Brunswick. Over Nicholson's time as President of Athletics New Brunswick, many great steps of progress were taken including the development of our organization's policies, the 2010 IAAF World Junior Track and Field Championships, and the ANB website. Harold is survived by his sister, Terry (Keith) Logan of Fredericton; nieces, Sandra (Dan) Michel of Fredericton, Shelley (Glen Saunders) Logan of Fredericton, Sonya Logan of Fredericton; nephew, Richard (Kelly) Logan of Fredericton; great niece Leila Logan and great nephew, Liam Carfar. Resting at the Britton Funeral Home, 2 High Street, Hartland with visiting hours on Friday from 6-8 p.m. The funeral service will be held on Saturday at 2:00 p.m from the Lorne Britton Memorial Chapel in Hartland with Pastor Michael Horsman officiating. Interment will be in the Greenwood Cemetery. If so desired donations can be made to the Harold Nicholson Scholarship Fund by contacting the funeral home (506-375-4343). Athletics New Brunswick will greatly mourn the loss of one if its founding and leading members. The CIS Cross Country Championships are set to take place this Saturday, November 9th, in London, Ontario . Several New Brunswick athletes will be making the trip with aims of top positions and medals in reach. 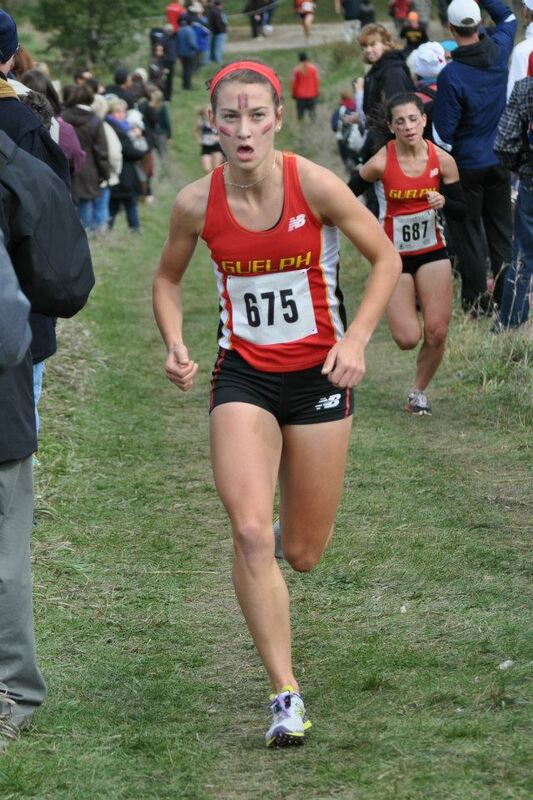 Genvieve Lalonde of the University of Guelph , in her final year of CIS cross country, will be aiming for a top spot after winning the gold medal in 2011 and placing fourth last year in a very close finish for third. The Guelph men's and women's teams have both won the CIS team championships every year since 2006 and are always a threat for the title and medals at this event. Sarah Myatt of the University of New Brunswick ( will be competing along with teammate and AUS cross country Rookie of the Year, Katie Robinson, after they placed 6th and 8th respectively in the AUS Championships. Ryan Cassidy of the University of Victoria will be aiming for a medal position after placing 10th at last years CIS Championships . Cassidy has been leading his team in the cross country season so far and has won, or placed in the top three at, each of his competitions in the CanWest conference, as well as winning against several American teams on competitions down in the United States. Matt McNeil of Dalhousie University will be looking to improve upon his placing at last years event where he placed 66th. McNeil finished 2nd at the AUS Championships. Lee Wesselius of St. FX University will be looking for an improvement from his placing last year where he placed 78th as a rookie. Wesselius placed 6th at the AUS Championships . Jeremie Pellerin of Université de Moncton will also be looking for an improved placing from last years event where he placed 37th. Pellerin placed 9th at the AUS Championships. “The CIS Cross-Country championships is one of the most competitive races in Canada. The depth and difficulty in competition is huge and for New Brunswick to have eight athletes competing in 2013 shows our competitiveness at the national level. We wish all of our athletes the best of luck, “ said High Performance Coach Jason Reindl, ChPC. Athletics New Brunswick and AthlétismeSud-est / South East Athletics (ASEA) are pleased to present an evening with Olympic bronze medallist Derek Drouin. At 7:30pm on Saturday November 9, at the Université de Moncton CEPS facility, the public are invited to come meet the London Olympic bronze medalist and Canadian record holderin the high jump. Derek will present on his experiences as an Olympic and World Championships medalist, and answer questions from the audience. He will also be available for autographs and even have his London hardware with him. Admission will be $5 at the door. There will be draw prizes of autographed items and photos, and a silent auction for a “Dinner with Derek” that will take place on the Sunday evening, November 10. Nov 2 2013 - 2014 Membership Now Open! Athletics New Brunswick is happy to announce that membership for the 2014 calender year is now open! Athletes, coaches, officials, and associates can register by going to http://anb.ca/General/forms.php. Anyone who registers before January 15th will automatically be entered to win a Timex GPS Watch valued at over 325$! Remember that membership includes your 2014 Athletics Canada membership, your insurance coverage, and discounts on goods and services from ANB. Athletics New Brunswick is very pleased to announce the finalists for the annual awards. The awards will be handed out at the 2013 ANB Awards Gala, being held on November 23rd at Camp Gagetown in Oromocto. The 2013 track and field season was perhaps New Brunswick’s most successful in history. Some of the highlights of the season include over 50 new provincial records, and a record 9 medals at the Canada Summer Games. In fact the total number of 9 medals at a single Canada Games is the most a New Brunswick team has ever captured at these multisport championships. In addition, both Coach of the year and volunteer of the year will be announced at the ANB Gala. The ANB Gala will take place on November 23rd at Camp Gagetown in Oromocto. Tickets for the Gala are $20 and must be purchased online at http://www.trackie.com/online-registration/register.php?id=961 before November 11th. Please note that tickets will not be available after this date.